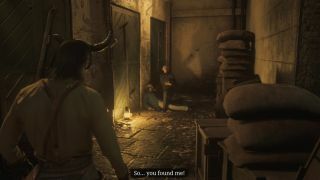 We all knew that Red Dead Redemption 2 was going to be a Western epic, but with Rockstar being Rockstar it was also going to be a safe bet that they would hide some interesting secrets in there too - with one of these being a genuine Red Dead Redemption 2 vampire. Yes, you read that correctly, a vampire. This creature of the night is lurking around Saint-Denis and is super creepy, but if you want to find it for yourself then there's a series of steps you need to follow. We've got all the details below on how to summon the Red Dead Redemption 2 vampire, so you can meet Nosferatu for yourself. To be clear, it doesn’t actually matter in which order you find each piece of ‘Mysterious Writing’ in Saint Denis. So if you’ve already found one or two, just skip through the guide until you have them all and read how to trigger the ending. If you’re starting fresh though, you may as well head to the Butcher’s near the docks in Saint Denis for the first piece. The rest are relatively within walking distance of each other, so it makes sense to speed it up. For this piece of the puzzle, walk up to the east side of Saint Denis where the marketplace is. Before you walk through the gate to where the Trapper has his stall, look to your right and you’ll find an inconspicuous alley. If you look to your left after the gate to the alley you’ll see a little broken wooden box. Look above the wooden box to find the writing in red on the left wall of the alley. Study it to acquire the second piece of the puzzle. Now you want to head over to the west side of Saint Denis where there is a long strip of shops. Venture into the alleyway beside the antique shop and you’ll find yourself in a little courtyard open to the elements. There’s a little prong of a building just behind the Gunsmith marker on the map. You want to find a small arched stone window there next to some scaffolding. Hop through and you’ll see the writing on the wall in red on your left. Study it to grab the third piece. If you’ve been following this guide, you won’t have to move very far to find the next piece. Head just south of your current location, further towards the docks. You’ll find a covered alleyway. Go under the stairs and watch the wall to your right. Once you come to the end you’ll see a chair and above that, the writing in red. You’ll know you’re there if you can see a grated green fence to your left. Study it in your journal and get ready for the final location! For the final piece of writing, pass the cathedral and head to the dodgy saloon in the northeastern quarter of Saint Denis. Across the road, you’ll find a red building which is the town soup kitchen. Head to the northwest edge of the building and you’ll find the writing to the right of the white wooden door. This is easily the most legible piece of writing so it’s quite hard to miss! Once you’ve scribbled each piece of writing into your journal, Arthur will create a star symbol that cross-references each spot we’ve studied to reveal the final location, the St. Denis Cathedral. First, you have to make sure that the in-game time is between 00:00 and 01:00. Make sure you’ve bought a pocket watch from the general store and hit ‘Down’ on the D-Pad to keep checking the time. If its morning, just head to the fancy saloon and sleep until nighttime. The map you scribble isn’t entirely accurate, but head there anyway, and then to the road on the south side of the cathedral. Straight ahead of you will be a small alleyway between two buildings. If you can see a small ‘x’ marker that denotes a corpse on your minimap, this means you’ve triggered the encounter. Walk into the alleyway and look to your right, and the vampire will appear after bleeding a corpse. Be careful, as the night stalker won’t attack you immediately. Walk towards him and choose whether you want to ‘Defuse’ or ‘Antagonise’ the conversation when the situation arises. The bloodsucker will eventually pull a knife on you, and you’re going to want to draw very quickly if you plan on killing him. All it takes is one slash and Arthur will die instantly, so arrive prepared! Good luck!